This new book by Sister Aquinata Böckmann discusses the Prologue and chapters 1, 2, and 3 of the Rule of St. Benedict. In a lectio regulae she plumbs the depths of Benedict's vision. Listen, the first word of the Prologue, is a keyword that describes the main stance of the individual monastic, the superior, and the entire community. Listening to the Scriptures and in them to Christ guides individuals and the community on how to "run on the way of God's commandments" toward the goal of communal life in and with Christ. The first three chapters of the Rule concretize the principles of this communal spirituality of listening: the importance of a rule and a pastor for maintaining the community's attentiveness to life; the superior's responsibility to listen to individuals within the community; and the mutual listening between leader and community members, regardless of their age. As in her earlier books Sister Aquinata proves to be a true guide into the spirit of Benedict's Rule, which provides sound principles for listening in common in a community of life. Aquinata Böckmann, OSB, PhD, is a member of the Benedictine Missionary Sisters of Tutzing, Germany. She has taught in Rome since 1973 at the Pontifical Institute for Spirituality and Moral Theology Regina Mundi and as the first woman professor at Sant' Anselmo. She is the author of Perspectives on the Rule of Saint Benedict and Around the Monastic Table, also published by Liturgical Press. Sister Aquinata Böckmann is herself a treasure in our worldwide Benedictine Order. Once again in her newest book, A Listening Community, she continues to share that treasure by unpacking the heights and depths of the heart and mind of St. Benedict, explaining clearly the origins and meaning of the Prologue and first three chapters of the Rule of St. Benedict. As we plunge into her book, new meanings emerge to challenge all of us who wish to live in the daily our Benedictine spirituality to a new level of communal sensitivities. Thank you, Sr. Aquinata, for all the wisdom you have shared with so many of us around the globe! "This masterful, faith-filled scholarship yields abundant intellectual, practical, and spiritual fruit." "Very warmly welcomed… Sister Aquinata is always able to combine the scholarly discussion with a prayerful approach to the Rule." This book is a must read for Benedictines old and new and for all who cherish the way of life taught in the Rule of Benedict. Once again, Aquinata Böckmann confirms her reputation as a top scholar of the Rule and one whose work is readable and accessible. She does not impose her ideas but lets the text speak for itself, giving close scrutiny to each word and phrase and then backing away to view their role in the overall structure and context of the Rule and the monastic tradition. A Listening Community is not only recommended; it is a must-read for people who, like me, think they know the Rule of Benedict. . . . I thought I knew the Rule of Benedict since I've lived as a nun for more than fifty years. Ever new, this classic text is brought forward by an expert wordsmith. Benedictine Sister Aquinata Böckmann is our contemporary Hildegard of Bingen. In an earlier book, Perspectives on the Rule of Saint Benedict, Sister Aquinata analyzes verses 1–4 and 45–50 of the Prologue with attention to the humanizing impulse of Benedict of Nursia, as distinct from the Rule of the Master's more ascetical tone. In this volume the reader is gifted with an extensive commentary on the entire Prologue plus chapters 1–3. 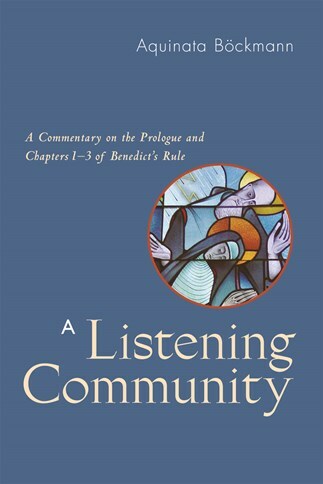 The author contends that the Prologue and chapters 1–3, viewed as a unit, form Benedict's unique apologetic for cenobitic life—for the formation of "a listening community" under a rule and a superior. Characteristically, Sister Aquinata is meticulous in her scholarship as she follows the principles of biblical exegesis applied to the Rule and consistently allows the text to speak for itself. She never loses sight, however, of the need for contemporary applications—in comments like "today this line of thought would have to be further expanded," or "how might we aptly translate this [understanding] for our time." Readers of A Listening Community will rejoice with gratitude for the Christ-centered relationality that is the soul of St. Benedict's call to live in community.